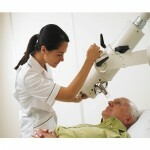 The Xstrahl 150 delivers impressive cosmetic results for superficial skin cancers. 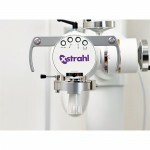 The energy range of the Xstrahl 150 means that superficial lesions can be successfully treated – from basal cell carcinoma, keloid scars and dermatological conditions such as psoriasis to other benign plaques. •	The Xstrahl 150 can be floor or ceiling mounted, making it easy to install alongside other equipment and adaptable where space is restricted. •	The range of movement in the treatment arm enables smooth adjustment and easy set up for each treatment field, even in difficult to access regions – and without compromising patient comfort. 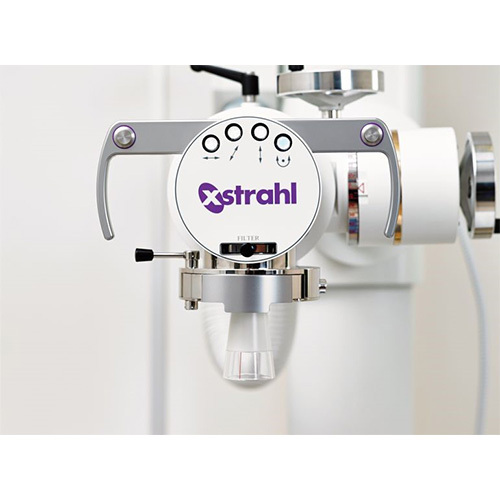 •	The Xstrahl 150 is supplied with eight open-ended clinical applicators, and a further range of non-standard applicators and filters is also available on request. •	Concerto software, Xstrahl’s clinical interface, provides an intuitive workflow for treatments and creates a unique and detailed clinical record for each patient, including treatment images. •	The physics interface, Fisica, allows for custom configuration based on individual requirements, in addition to allowing calibration and system maintenance. •	The advanced software provides a clinical and physics interface enabling the operator to accurately define patient demographics and treatment parameteres in addition to delivering controlled clinical radiation exposures.